Ghost in the Shell: Stand Alone Complex is a PS2 action game based on the anime of the same name and released in November 2004. Major Motoko Kusanagi, member of a heavy-duty government task force, must solve criminal cases in her dystopian cyberpunk era. This time around, she must get to the truth of a case known only as T.A.R. Regrettably, Captain Planet is currently occupied. Best time on Easy difficulty: Single-segment 0:49:47 by Greg 'Setz' Tyndall on 2011-09-23. Howdy. 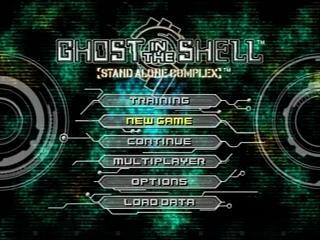 This is an easy mode, single-segment speedrun of Ghost in the Shell: Stand Alone Complex for PS2. I use some glitches and oversights to save time, but the game is largely straight pathing from the entrance to the exit of each map with occasional objectives thrown in. Despite the difficulty setting, this run can be deceptively tricky. If you get into even a small group of enemies, they can easily stunlock you, especially if they have either a grenade launcher or a shotgun. Sometimes a bad bout of luck can have a few enemies taking off most of your health, and other times the jumping or ledge-grabbing can completely work against you. As with any single-segment run, there are mistakes. I die a total of four times in this run, one of which is intentional early on. (Second death: Level 6, I get shotgun stunned and then hit with a grenade launcher. Third death: failed Oniyama skip. Fourth death: Level 9 Shaft, ledge-grab failed on me.) Otherwise, I estimated that I lost a total of 3m19s to mistakes and deaths. If you're interested in seeing more tricks and glitches like the ones in this run, I keep my Youtube account updated with exploits for this game and a few others. 1-E crane death - Activating the crane and then waiting for it to get into position in this section usually takes around 17-20 seconds before you can safely cross, but as soon as you activate the crane, the game saves a checkpoint. Throwing yourself off brings you back to the checkpoint with the crane already positioned for crossing, taking only about 9 seconds. 4-A invisible wall jump - Between the Japanese release and the US release, the developers tightened up this section by preventing the player from walljumping off the very top of the glass barrier surrounding the area, but I use a lamppost and a tree to reach an invisible wall that allows me to drop down and skip the segment beneath the building. Vent crunching - While crouch-walking through vents, pressing the left stick in causes Batou to jump forward, since he couldn't successfully stand. This probably cuts in the realm of 10 seconds from both mandatory vent crawling segments. Camo roll - A Batou-specific trick that keeps the enemies from noticing him. Rolling into a wall and then continuing to roll afterward messes with the AI, and allows me to take less damage in areas with high enemy concentrations. 9-A Oniyama jump - Both of the walls outside the walkways here have an oversight involving a ledge that allows you to jump inside the building and drop down three floors, skipping about twenty seconds of running.